Mike Holt, National Electric Code (NEC) consultant to Electrical Construction & Maintenance (EC&M) Journal, says, "Rigid PVC conduit…provides many of the advantages of rigid metal conduit, while allowing for installation in areas that are wet and corrosive. This type of conduit is commonly used as an underground raceway (conduit) because of its low cost, ease of installation, and resistance to corrosion and decay." Polyvinyl chloride (PVC) conduit doesn't require expensive tools like a hydraulic bender and power threader to work with, so it's the ideal conduit for the home handy person to work with. Calculate the size and number of conductors and their insulation class to be installed in the conduit and whether the PVC conduit is graded as a "Schedule 40" or as a "Schedule 80" conduit. Turn to Annex C of the NEC and select Table C9 or C10 for PVC Schedule 80 and 40 respectively. For this tutorial, assume Schedule 80 conduit with twenty AWG 10 copper conductors with THHN insulation. Use Table C9. Look under the first column, labeled "Type," locate the insulation type "THHN." Locate the conductor size under the second column in the same section of the Table where you located the insulation type "THHN." Move to the right until you find 20, the number of AWG 10, THHN, and copper conductors to be pulled in the conduit. Reading to the right you will find first 13, then 23, but no 20. 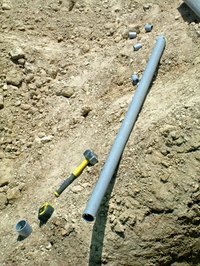 The smallest conduit that you could use is 1 1/4 inches in diameter. Good design practices dictate that you allow for future growth, so you should choose the next larger conduit and install 1½-inch conduit. List the number of the conductors by size. For this tutorial there will be six AWG 8, THHN stranded copper, 10 AWG 10, THHN stranded copper, and 15 AWG 12, THHN stranded copper conductors. Find the overall area in inches for each size conductor, using NEC Table 8. In this case the AWG 8 conductor has an area of 0.017 square inches, the AWG 10 conductor has an area of 0.011 square inches, and the AWG 12 conductor has an area of 0.006 square inches. Select 0.495 square inches, which translates to a 1¼-inch conduit. Looking at Article 352 Table 4, the two closest areas available for a 40 percent fill are 0.275 and 0.495 square inches. Good design requires using larger than minimum size conduit to allow for adding more conductors in the future. Electrical loads expand over time and it much easier and economical to be able to pull the new conductors in existing raceways/conduits.